WINNIPEG - If you are going to duplicate a month’s sales activity, do it when it is a good one and that was the case in November. MLS®sales of 878 units in November were one sale higher than November 2016 and 4% above the 10-year average for this month. Only once in 2015 did November sales edge over 900, so not a big difference in sales. A solid performance in November and year-to-date sales of 12,890 ensures 2017 will be no worse than second highest on record. 2016 was the best year ever with over 13,600 sales. A highlight in November which has been observed throughout the year is the strength of the upper end market. There were 50 residential-detached sales of over $500,000 compared to 34 last November and 4 sold for over $1 million with one closing at $2 million. One condominium sold for $1,575,000. As much as the two MLS® property types of residential-detached and condominium represent nearly 86% of total sales, the single-attached property type has emerged this year as a real solid performer with over 500 sales and 4% of total MLS® market share. In November unit sales were up 22% and year-to-date sales are ahead by 11%. Balanced market conditions still prevail overall with over 4 months of listings available if there were no new listings added on to the MLS® system. Condominium supply remains elevated in comparison to residential-detached. Based on slower condo sales in the upcoming months over 700 active condo listings equates to at least 7 months of supply. 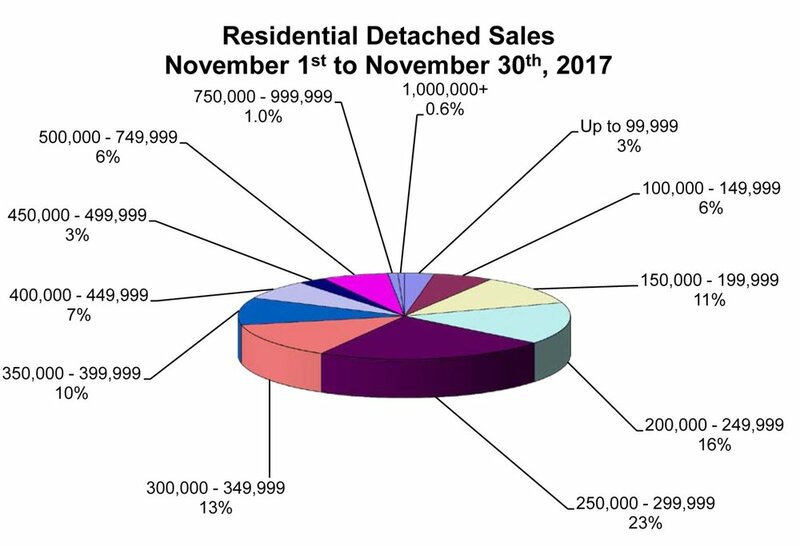 This difference is really borne out when you see in November 32% or nearly one out of every three active residential-detached listings sold to just 15% of the entire condominium inventory turning over. MLS® area neighbourhoods such as Riverview, Crescentwood, River Heights, Wolseley, Southdale, Fort Garry, Linden Woods, Garden Grove and Harbourview South show depleted inventories in relation to residential-detached sales this year. Commencing January 1, 2018, a new stress test comes into effect on Canadians making down payments of over 20 per cent and therefore not requiring mortgage insurance. It applies to all federally regulated financial institutions and requires the applicant to qualify for mortgage payments based on the greater of either the Bank of Canada’s five-year benchmark rate or their contract mortgage rate plus two percentage points. Backing up WinnipegREALTORS® claim that it has one of the most affordable major real estate markets in the country is the percentage of sales it has under $300,000. In November 59% of residential-detached sales and 77% of condo sales were under $300,000. The busiest condominium price range at 26% of total sales was from $150,000 to $199,999. Helping WinnipegREALTORS® achieve another very successful year of MLS® sales is Manitoba’s well diversified and stable economy,” said Peter Squire, Vice President of External Relations and Market Intelligence. He noted the unemployment rate is averaging 5.4%, second lowest among provinces and employment has increased by nearly 10,000 in the first 11 months of 2017. Average weekly earnings increases of 2.4% as of September 2017 are also second among provinces.